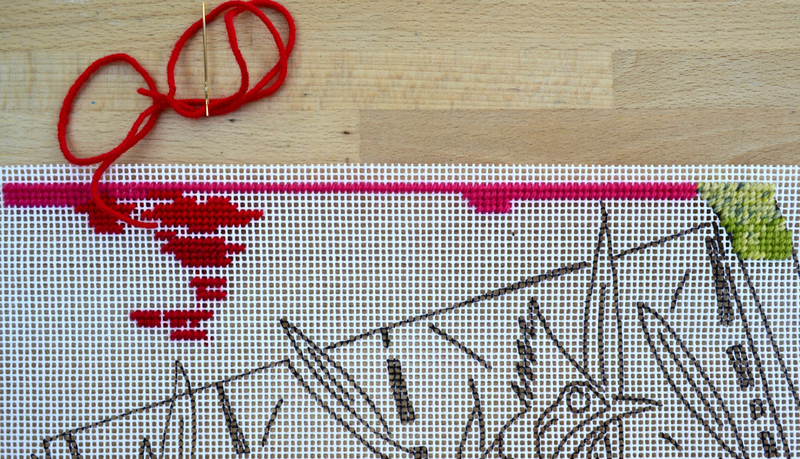 Doing needlepoint, well continental tent stitch at least, is very slow, which is why I imagine there are quite a number of unfinished projects in the world. I don’t mind the slowness at all; I knew there was no way it could be hurried, and frankly that’s fine with me. I’ve produced a lot of textile work, using other methods of making, over the last 10 years or so, and I don’t need any more large pieces to store, thank you. I love the digital, pixillated appearance of the work, and the way it, albeit very much in its own time, sorts itself out, and reveals the finished piece, like slow motion magic painting. I’m not sure if magic painting still exists, if not, perhaps it could be the next big thing after colouring books. However, the series of work I now seem to have embarked upon will all be in tent stitch, so that’s the next 14-29 years sorted, work wise. Even worse, I want to illustrate some haikus I’ve written, with small stitched pieces of work. I have been experimenting with size 14 canvas and thicker embroidery threads, and quite like the look. I saw an exhibition of illuminated manuscripts a couple of years ago, and the tiny, detailed, richly coloured works have been lodged in my brain since, so they are the inspiration for the tiny pieces. 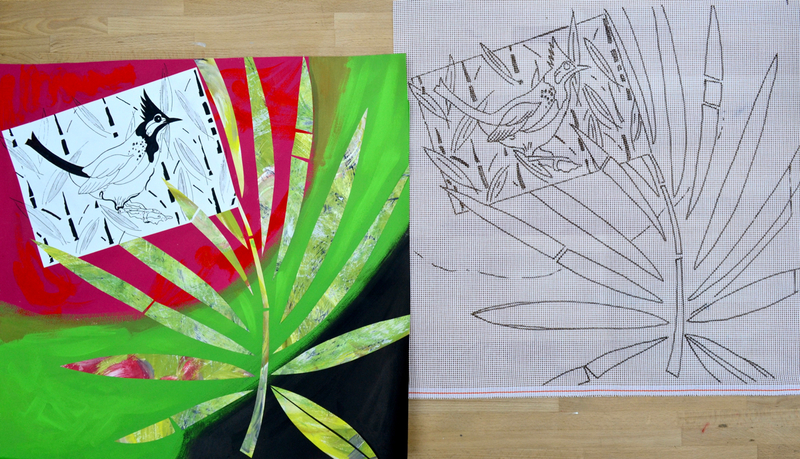 So I have large, medium and small pieces on the go, mostly in my head. No wonder I need a lie down. Needlepoint Number One is moving along, now I have a little more time. Here are a couple of images. Since I have no woolly stash, it seemed necessary to address that state, so I went into John Lewis at the weekend to fondle some yarn. I know all is available on the internet, but I seriously needed to spend an hour having a good old feel and think. I want to try different weights and thicknesses, so simply bought what I liked and thought would work. The yarn wall was the quietest place in the whole shop, and certainly the quietest area of Grand Central, the new shopping extravaganza in Birmingham, which was packed with people gazing upwards in wonder at the ceilings, or downwards into their ‘phones, and possibly sideways into shop windows. Anyway, it was a bit like running the gauntlet. So with my new woolliness, some of which is shown below, I had to have a go on Needlepoint Number Two, also below. 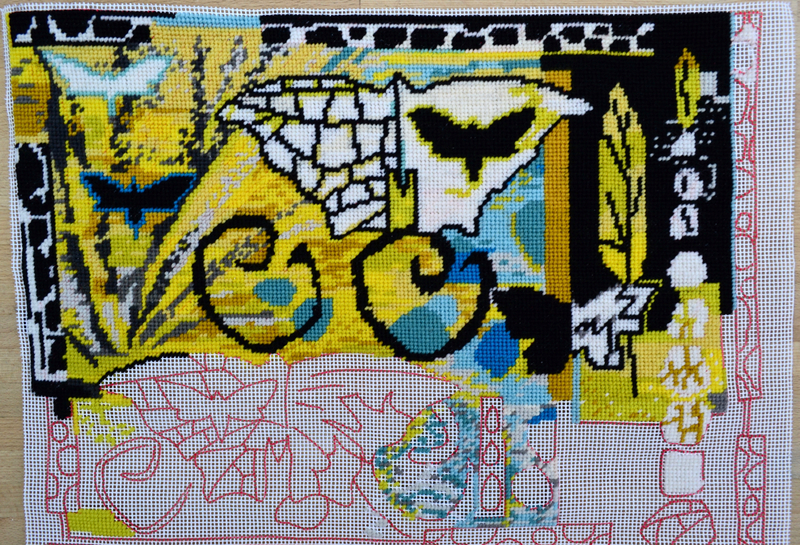 Needlepoint Number Two drawn out on the canvas, with the cartoon to the left. Like the piece above, it’s 50 cm square, not as tiny as it looks here. And trying out some yarns; a merino wool, some 100% cotton yarn, a wool/bamboo mix and a variegated wool/polyamide mix. They all worked well, so they can continue to mix in with the Anchor wools to add different textures and light handling qualities. < Previous The necessity of colour. Thanks Peg, I’m finding it’s good to try something ‘new’ and explore ways of making it work for you. Brilliant idea Sonja, I think Kaffe Fassett does that too, I’ll try that out at some point. Hi Steph, this IS a whole new direction for you, lovely to see you designs in a different medium! Wow Stephanie – welcome to my world! You do know it’s a dangerous obsession don’t you, have fun! I love your water and stones piece in your last blog post, glorious. 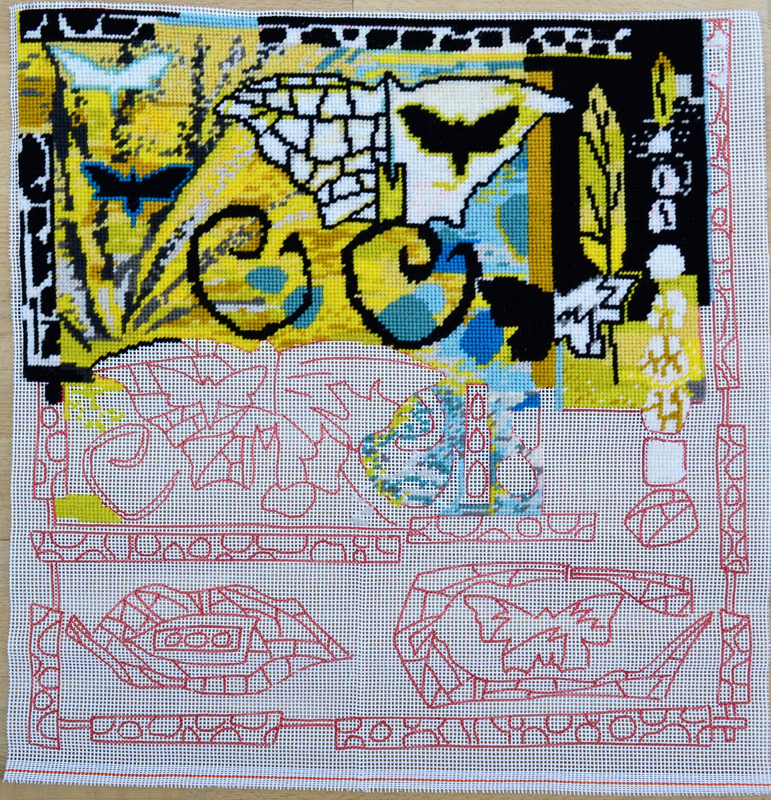 Dreaming in Stitches is Anny’s blog, click onto it via my sidebar. You must eithr have the patience of a saint or a clear, long term vision of what the finished articles will be like to commit to this project Steph. I salute you! I am immensely patient with my work Lesley, but vilely impatient in most other aspects of life! I think you keep at them to discover what they will be like, they are unfolding personalities; I’m lucky that I find it quite magical. I love these pieces Steph and the big step in making a considerable change to the way you are working. Thank you. It is quite a change, and like all changes that happen with me, unplanned, but I was feeling a change was necessary. It’s certainly slowed me down! 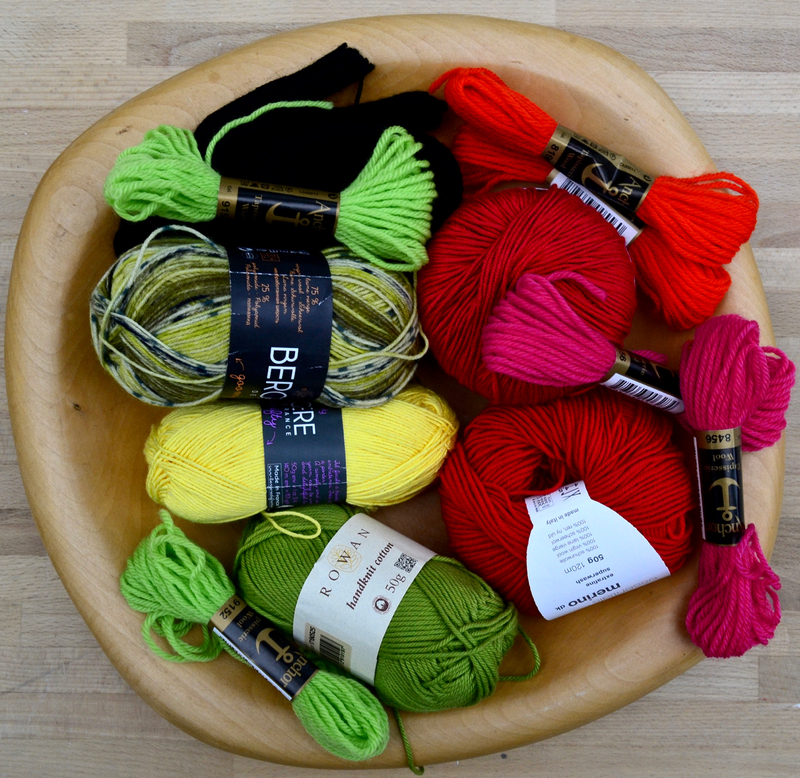 There are a host of other fascinating threads to try if you can get yourself to the Harrogate Knitting and Stitching Show in November. Welcome to the world of the endlessly spiralling stash! Ah yes, the stash. I’ve reduced my fabric stash over the last couple of years, and have quite a large thread collection, which I was making inroads into, but this sort of stitching will move it along much more quickly. Trying different threads and yarns is part of the excitement, and the learning process. Thanks Sheila, a creative change is always exciting. Good idea about the charity shops, another project to pursue!